Bertazzoni makes high quality, deluxe kitchen appliances. We do Bertazzoni appliance repair and maintenance. Bertezony has been on American markets only since 2005, but it has been very popular in Europe and other countries since the 19th century. Very few appliance repair companies in America know how to do repairs and find parts for Bertazzoni. We are factory trained and certified to fix all the Bertazzoni appliances including ranges, cooktops ovens, microwaves, refrigerators and much more. We can order genuine Bertazzoni parts and expertly install them for you. Our demanding performance standards cover product maintenance, diagnostics, repair and customer relations. With us, your Bertazzoni is in good hands. If you are a proud owner of Bertazzoni kitchen, you will know how well crafted and how technologically advanced your appliances are. To do maintenance and repair on such appliances you need a real professional. Our company specializes in all the European, top brand and deluxe kitchen appliances. We have the resources and equipment required to repair you Bertazzoni appliances. But most importantly we have all the skills and knowledge needed for this kind of work. 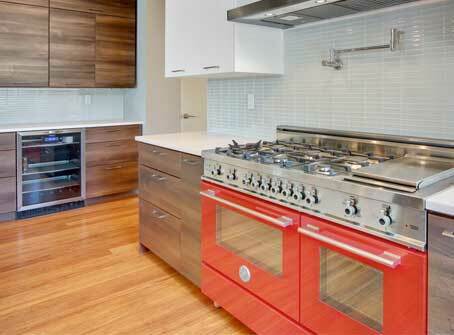 Our company has been servicing Bertazzoni since they came on US market in 2005. We fix Bertazzoni professional series, master series and heritage series. Besides having all the skills necessary to do a great job on Bertazzoni appliance repair, we also offer you some of the best customer service possible. Our technicians are not only tech savvy and fast, but they are also very friendly and respectful. They will answer all your questions, go over the price with you and explain to you the whole process. They will try to make the appliance repair appointment as fast and convenient as possible. Also, we offer you flexible scheduling, accurate estimate and FREE service call with every repair job. We also have a 3 yearwarranty on all the parts we install. Our rates are upfront and fair. You get the best quality appliance repair service at a very reasonable price. We are a company with more than 30 years of experience. Our goal is to do excellent, professional repair service on deluxe, high ticket, custom and European brand appliances. Those are the kind of appliances that our competitors do not have skills or resources to fix. But we have what it takes to repair almost any appliance out there. Any brand or model of kitchen or laundry appliance can be fixed if we find the parts for it. That includes refrigerators, dishwashers, washers, dryers, stoves and ranges, ovens, steam ovens, microwaves, freezers, ice makers, BBQs, pizza ovens, patio heaters and much more. Our company is family owned, and family managed. We have two offices and serve entire Los Angeles, Ventura County, Marin County and East Bay area. With our experience and resources, you can be sure that your appliance is in good hands. Give us a call or fill out our short contact form and our team will immediately set up a convenient appointment for you. They will offer you a accurate estimate and will get information from you about your appliance. Usually, this information is enough to give us an idea of what your problem might be and what parts we need to preorder. We usually preorder parts if we can so that the whole repair process goes much faster. Once we receive the parts, our technician will be on his way to your house. He will bring with him all the tools, equipment and parts needed for your particular job. As soon as our technician gets to your house, he will get to work. He will quickly analyze what is wrong with your Bertazzoni appliance and figure our the best way to solve the problem. After the job is complete, our technician will clean up after himself and dispose of the old parts. He will plug your appliance back in and test it for safety and functionality issues. Only after he is sure that your appliance is working perfectly will he hand it over to you. You will be happily surprised at how well your appliance is working. Our technician will also answer any questions you might have and give your some useful tips on how to maintain your appliances. When you have such a valuable appliances it’s very important to keep them well maintained, to change filters and do all the upkeep. They best way to do it is to hire a professional to do it for you on an annual or bi-annual basis. Our company offers such maintenance program. This program covers all appliances in your kitchen and laundry. As a part of this program, our technicians will do all the maintenance for you on a regular basis. They will inspect your appliances every time and catch any problems before they become significant. This maintenance service will save you time and money in a long run. Why choose us to do Bertazzoni appliance repair for you? First of all, we are one of the very few companies in the US who can do Bertazzoni appliance repair. Bertazzoni is fairly rare and very exclusive appliance most other companies do not have the knowledge or experience to deal with it. But we do. We have been repairing Bertazzoni appliances from day one, and all of our technicians are very familiar with this brands. In fact, they are all factory trained and certified. We can order you any Bertazzoni part you will need, and we offer 3 yearwarranty on those parts. We work hard to please our customers! With us, you can be sure that your Bertazzoni appliance will function great and will be safe to use. We offer some of the best customer services around and make each appliance repair appointment fast and convenient for you. For Bertazzoni appliance repair, please call us at 925-265-7782 in East Bay or 628-214-0064 in Marin County. Or you can fill out our short contact form. We would love to talk to you and answer all of your questions. Besides Bertazzoni appliance repair are also certified to repair Asko, Bosch, Dacor, DCS, Electrolux, Fisher&Paykel, Frigidaire, GE, Jenn-Air, KitchenAid, La Cornue, LG, Liebherr, Marvel, Miele, Perlick, Samsung, Siemens, Sub-Zero, Thermador, Traulsen, True, Viking, Whirlpool, Wolf. Bertazzoni makes high quality, deluxe kitchen appliances. We do Bertazzoni appliance repair and maintenance. Bertezony has been on American markets only since 2005, but it has been very popular in Europe and other countries since the 19th century.